We enjoyed the drive from Bilbao south and there was no doubt we were now in Spain. Because we had reservations for our Airbnb in the Algarve the next night we took the direct route across Spain staying on the autopista most of the time. We spent the night in Salamanca, a city of nearly 150,000, and it turned out to be a great choice. 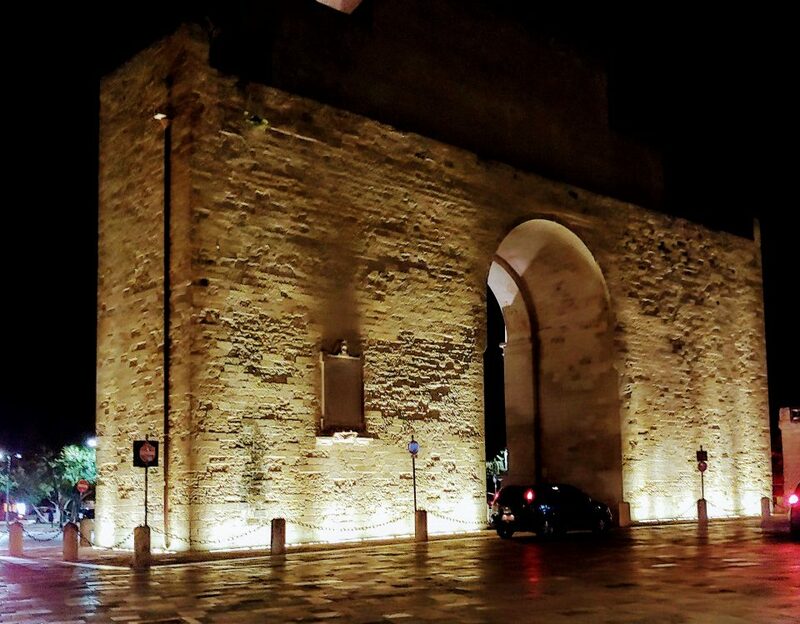 It is a city that was founded in the 1100’s by the Carthaginians and was the intellectual center of Spain in the 1500’s and 1600’s. It is home to one of the oldest and finest universities in Europe. Our hotel was just a 5 minute walk to the historic center, the Plaza Mayor. We were a bit skeptical about finding a place to eat as it was just 6:30, a bit early for dinner in Spain, but right on the square we came upon a small inviting restaurant, Cafe Novelty. Talk about lucky. The food was great, the service was wonderful and by pointing to pictures we were able to explain what we wanted. I knew just enough Spanish, to ask for “Una cervesa, por favor.” And also, “Una mas, por favor.” It’s interesting that in Europe we find when you order a beer, you are asked if you want large or small but never the kind. And as usual the local beer was great! It turns out, we read later, that Cafe Novelty was founded in 1905 and is the oldest restaurant in Salamanca. From 1905-1964 it was known as the Cafe Nacional. It has been a gathering place for writers, artists and politicians over the past 110 years including such people as Jimmy Carter and Francois Mitterand. We reached Lagos, Portugal, late afternoon the next day. Driving here is as easy as it is in the States. Having Google maps on my phone is an added bonus. But we have found that when the local signage differs from what the phone says, it’s best to follow the signs. We found our way into Lagos following narrow curvy roads that made us wonder if we were on the right track and while they got us to our destination, we found after we were here that there are much easier routes to the main roads! We’ve learned! We were met at our lodging by a local real estate person who quickly showed us around the apartment but unfortunately didn’t know many of the details…i.e. how do we access the mail? How does the stove work? What about the dishwasher? But I texted the man we are renting from (who lives in Ireland) and he quickly filled us in on the details. Our apartment is on the first floor which in Europe means the second floor. We can access the apartment by either inside steps or an elevator from the parking garage on the main floor. But it seems really odd to walk outside our sliding doors, on the second floor, and stand beside the pool. Sidewalks and a footbridge take us from our apartment to the town which has a large marina and a main street that follows the harbor to the Atlantic. Along the harbor walk are shops that sell a variety of local items especially those made from cork. Cork trees are an important resource of Portugal and since much of the world has moved to using synthetic corks in their wine bottles, Portugal has felt the impact! Purses, jewelry, even clothing made of cork is for sale throughout the area! Our favorite part of the Algarve is the spectacular beauty. The rugged cliffs jut out into the sea and with each turn the view is more beautiful than the last! Like most other European cities we’ve visited Lagos has their Saturday morning market. We particularly enjoy the citrus fruit. Being from Michigan it’s hard to get used to the beautiful huge oranges and lemons that grow on the trees in and around the city. The area is truly a culinary delight particularly if you like seafood which we do. Grilled sardines are a Portuguese specialty. The sardines are much larger than what we’re used to in the US, about the size of perch. They are yummy! But we also found some unusual things in the market, like chocolate covered sardines (which I didn’t try). We had no idea so many Brits take their holidays here. Nearly everyone speaks English and there are also many signs in English. I had understood before we came that Portuguese is similar to Spanish. I don’t find that to be so. To my ear it doesn’t sound like Spanish and understandably the Portuguese don’t want it assumed that they speak Spanish. So most of the time beyond the initial greeting of, “Hola,” we reverted to English. The only other Portuguese I know is, “Abrigado” thank you. Generally the people we have met are very friendly and understand that Americans (as well as the Brits to the best that I can surmise) generally speak only English! Because of the presence of so many Brits there are a lot of British restaurants, particularly near the marina. I think we chose the right time to come to Lagos given that during the summer tourist season it is mobbed with people coming from all over the world to enjoy the beaches! In places they remind us of the beaches of Lake Michigan with the white sand and blue water as far as we can see. Southern Portugal is a land of contrasts. Historic buildings, forts and churches are mingled on cobblestone streets with modern shops and restaurants. Lagos is about 3.5 hours by train from Lisbon so when Cary was able to visit from Rome for a few days we decided it was a must see. We drove to Tunes about a half hour away, parked the car and got a direct train to Lisbon. Round trip for senior citizens costs a little more than $20 and driving it with tolls and the cost of petro is a costly venture…not to mention we didn’t have the headache of trying to find a place to park. After checking into our hotel we boarded a hop on hop off bus which turned out to be a good idea given that the clouds burst into a torrential rain for most of the afternoon. Even so, we found Lisbon to be a beautiful capital city. There are Portuguese tiles everywhere. They’re called azulejos from the Arabic meaning polished stone. The first came into being in the 15th century when Portugal was still under Moorish rule. Since that time they have been in and out of style. Many of Lisbon’s cultural elite, at the turn of the 20th century didn’t like them, feeling they “were for the poor people.” But in the late 1900’s the tiles were revived and now you see them on very old historic buildings as well as decorating new buildings. The rainy day in Lisbon was the exception. Bob read that the Algarve has 3000 hours of sun a year which averages 8 hours of sunshine a day and which makes exploring the area really pleasant. We particularly enjoyed Sagres which is the most southwest point on the European continent. We visited a fort there which is where Henry the Navigator supposedly had his navigation school. Inside the fort is a Wind Rose, approximately 200 feet across that dates from the 1500’s. It was uncovered by accident in the early 1900’s and its original purpose is still unknown. One theory is that it was some sort of a navigational tool; others believe it is a kind of sundial. Prince Henry was an interesting guy! His name implies that he was an explorer, when in actuality, he basically navigated one trip to northern Africa, and then supervised the trips of others, the majority of which began in Lagos. When one stands on the beach and gazes out at the Atlantic it is hard to imagine the amount of courage it must have taken to set sail…wondering if indeed they were going to sail off the edge. There’s also a site inside the walled city of Lagos where Henry first brought slaves from Africa to be sold, after putting them on display, thus beginning the slave trade! A favorite place for us is the boardwalk at Alvor just about 8 miles west of Lagos. There they have constructed more than 5 kilometers of boardwalk along the Atlantic coast. In addition to the great walk, we found a fabulous restaurant, Restinga’s, that has great seafood, great service at reasonable prices! Their fish soup is scumptuous! We were thrilled when a friend from high school posted on Facebook that he and his wife were going to be in Lagos while we were here. We met up for a drink at a cafe near the harbor and it seemed surreal to be catching up on 50 years since high school in a place thousands of miles from Michigan City, Indiana, where we grew up! Janice and I enjoyed meeting with all of you. We really liked Lagos! Janice wanted to stay longer, but we had appointments in Lisbon before we left for home. Have excellent fun on your excellent adventure.